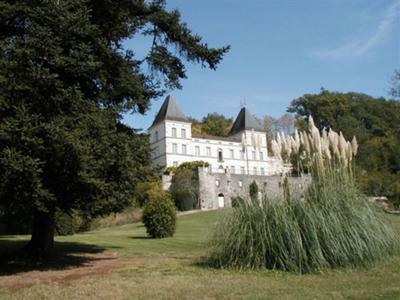 Imposing chateau set in 14 hectares of woods and formal gardens on the banks of the river Lot. A truly unique property offering large, well proportioned accommodation with scope for additional accommodation. ideal for a grand family home or small hotel business. The grounds are delightful with a mixture of gardens, lawns, fields and woodland supporting many breeds of local wildlife. The property, whilst enjoying the peace and quiet of its own private estate is not isolated. Local villages and the nearby market town offer a wide selection of restaurants, shops and regional activities. The property dominates its own grounds of fourteen hectares and is accessed by a long private drive with electric gates. The location is remarkable, facing South, the chateau overlooks a dramatic bend in the river Lot on the outskirts of the attractive market town of Villeneuve sur Lot. Immediately surrounding the buildings are more formal lawns and flowerbeds and shrubbery. There are a number of wooded areas and many delightful walks and trails to enjoy. The grounds are easy to maintain and the gardens are well established. There are a number of natural springs on the estate and the entire garden has an automatic irrigation system. The property is laid out on three floors with two large rooms on the top floor floor, one in each turret. The property is in good condition throughout with high ceilings, oak and stone floors, original features, well proportioned light rooms, marble topped kitchen and bathroom units, and authentic stone fireplaces. A certain degree of redecoration should be envisaged. The property offers a superb blend of authentic traditional finishes mixed with modern comforts and functionality. There is a full central heating system powered by two boilers, one burning wood which is in plentiful supply from the grounds and a second which runs on oil. The Chateau de Massanes is surrounded by a private estate extending to around 14 hectares. The estate is varied with large wooded areas, shady openings, a long running stream and rocky outcrops of cliff. The grounds are full of leafy walkways and rides which provide access to all corners of the estate. 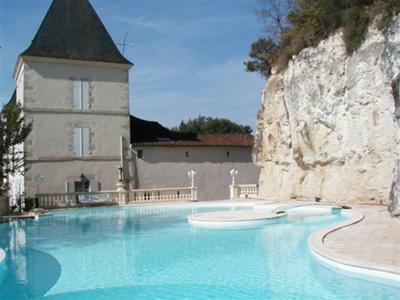 The Chateau is equipped with a large heated swimming pool. The pool area has ample seating areas and a complete outdoor kitchen with barbeque. The property has a strip of riverside frontage on to the river Lot which offers numerous possibilities for fishing and water based leisure activities. The central entrance hall has polished stone floors and a stone staircase giving access to the principal reception rooms. The bedrooms and bathrooms are all situated on the first floor. There are 5 large bedrooms and 2 smaller guest bedrooms, accessed from a spacious central hallway. The bedrooms are all extremely well proportioned, the master bedroom has an en suite bathroom and a dressing room. There are three bathrooms, all with showers, all very well appointed. A spa room houses a Jacuzzi, shower area and a sauna. Most rooms are carpeted. One room is currently used as a gym but is intended and prepared for use as a bathroom. All rooms have ample built in cupboards. The central hallway and the stairwell have very high ceilings and light wells giving a light and airy feel to the upstairs. All rooms benefit from central heating radiators.